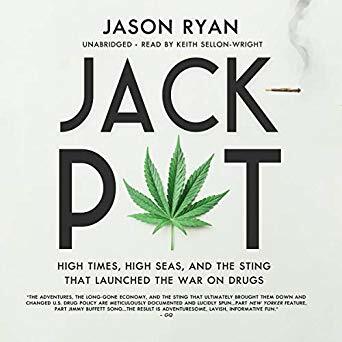 Jason Ryan, Keith Sellon-Wright (Narrator), "Jackpot: High Times, High Seas, and the Sting That Launched the War on Drugs"
In the late 1970s and early ’80s, a cadre of freewheeling Southern pot smugglers lived at the crossroads of Miami Vice and a Jimmy Buffett song. These irrepressible adventurers unloaded nearly a billion dollars worth of marijuana and hashish through the Eastern Seaboard’s marshes. Then came their undoing: Operation Jackpot, one of the largest drug investigations ever and an opening volley in Ronald Reagan’s "War on Drugs". In Jackpot, author Jason Ryan takes us back to the heady days before drug smuggling was synonymous with deadly gunplay. During this golden age of marijuana trafficking, the country’s most prominent kingpins were a group of wayward and fun-loving Southern gentlemen who forsook college educations to sail drug-laden luxury sailboats across the Mediterranean, the Atlantic, and the Caribbean. Les Riley, Barry Foy, and their comrades eschewed violence as much as they loved pleasure, and it was greed, lust, and disaster at sea that ultimately caught up with them, along with the law. In a cat-and-mouse game played out in exotic locations across the globe, the smugglers sailed through hurricanes, broke out of jail, and survived encounters with armed militants in Colombia, Grenada, and Lebanon. Based on years of research and interviews with imprisoned and recently released smugglers and the law enforcement agents who tracked them down, Jackpot is sure to become a classic story from America’s controversial drug wars.